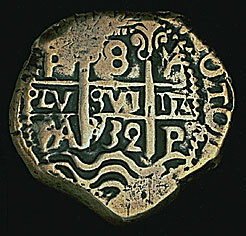 The colonists living in New France from the mid-1660s on used barter to exchange goods but also used metal coins, such as this 15-sol French coin dated 1670. However, there was never enough hard currency to go around. Silver coins that were sent from France were quickly taken from circulation by local merchants, who immediately returned them to France to pay their taxes and to buy European-made commodities. 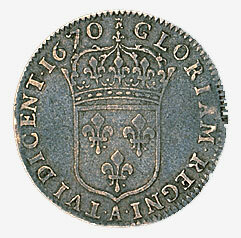 The shortage of coins persisted throughout the history of New France. As a substitute, the inhabitants of New France sometimes used the Spanish-American silver coins minted by the Spanish in Mexico and South America. Although they were banned by the French government to discourage trade with the enemy, this coin circulated widely in New France.